The former home of Henry VIII, Hampton Court Palace, will play host to a selection of some of the rarest Ferraris ever built as Concours of Elegance gets underway from 31 August to 2 September. Ferraris from 1950 to the present day will appear in the Main Concours event, spearheaded by the unique and beautiful 166MM/ 212 Export ‘Uovo’. 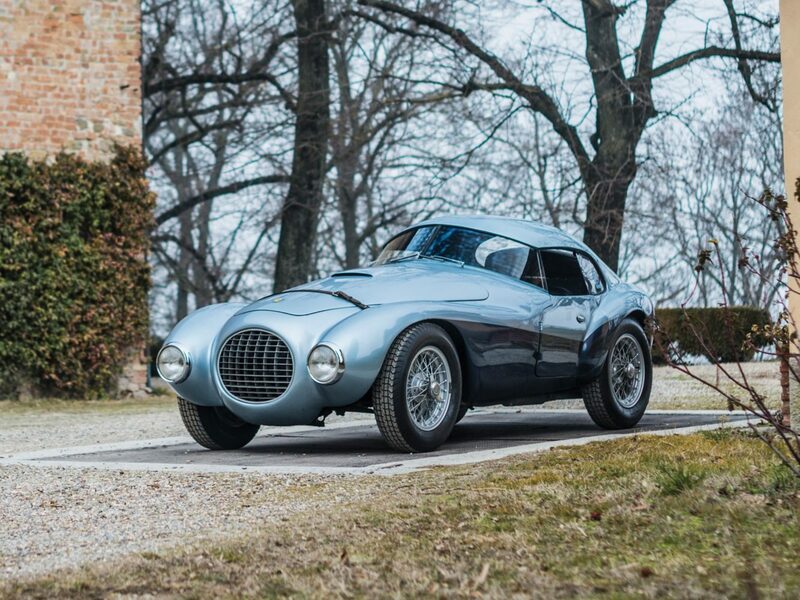 The ‘Uovo’ is an absolute one-off, designed for Count Giannino Marzotto as the ultimate sports racing car of its day. The design is not only aerodynamic but also lightweight, inspired by the aeronautical training of the car’s designer, Franco Reggiani, shedding around 150kg compared with similar Ferraris of the time. The bespoke design, complete with a reflection-free windscreen made of crystal, worked wonders on the car’s performance, granting it a number of race wins, including the 1951 Giro della Toscana. Sold very recently by RM Sotheby’s, the ‘Uovo’ has rarely been seen in public, making the Concours of Elegance a special opportunity to see one of the world’s most special Ferraris. Joining the Uovo is the Ferrari 500 TRC by Scaglietti. Named after the FIA ‘C’ racing regulations to which it was built to comply, this 500 TRC, or ‘Testa Rossa C’, is one of the most beautiful Ferraris ever built. This particular example is the last TRC produced, and the last ever four-cylinder car Ferrari made. It also comes complete with an impressive race history, including class wins at both the 1957 12 Hours of Sebring and 24 Hours of Le Mans. Then there’s the extraordinary 365 California Spyder. One of only fourteen ever made, this car was designed by Pininfarina as a direct successor to the 500 Superfast Coupe. Named “California” after its 250 predecessors, the 365 Spyder was fitted with a sophisticated 4.4-litre V12 engine, capable of producing up to 320hp. Also on display at the Concours is a 1962 Ferrari 250 GT SWB Berlinetta Scaglietti – one of 165 built. Featuring a 3-litre V12 engine, the 250 GT SWBs were a shortened version of the long-wheelbase TDF (Tour de France) cars, fitted with modified suspension for higher cornering speeds. Any Ferrari 275 GTB is special, but the alloy-bodied Long Nose appearing at Hampton Court Palace between 31 August – 2 September deserves extra attention. One of just 80 examples, this car has the lighter alloy body, the Long Nose design and the earlier two-cam powertrain. The 275 was designed by Pininfarina, built by Scaglietti, and was the first Ferrari to feature fully independent transaxle suspension, pioneered on-track by Ferrari. Once considered the ‘entry-level’ Ferrari, the Dino has gone on to become one of the most sought-after Ferraris of its era, and Concours of Elegance will be displaying one of the 357 early L-Series cars – a Dino 246 GT. Featuring a six-cylinder mid-mounted 2.4-litre engine, which produces 195bhp, the Dino is capable of 146mph. This year marks the 50th anniversary since the first Dino was produced, in 1968. No line-up of Ferraris would be complete without an appearance from the brand’s legendary GTO badge, and Concours of Elegance will be bringing perhaps the rarest GTO of them all. The 1983 Ferrari 288 GTO Prototype, known simply as the Ferrari GTO, is one of only six built, and one of three that remain. And finally, a 2018 Ferrari GTC4Lusso ‘Tailor Made’ will also be present in the Main Concours. Finished in a bespoke Arancia paint, this car was customized to exactly the owner’s specifications. Released earlier this year as the replacement for the Ferrari FF, the car features a 6.3-litre V12 engine, capable of reaching speeds in excess of 200mph.